(Newser) – On the laundry list of public despair over government's inability to do anything right, "executing criminals" doesn't usually get a mention—particularly in Iran, which is more than a little practiced at capital punishment. But the Guardian presents the case of Alireza, a 37-year-old drug smuggler sentenced to death for having been found in possession of a kilo of meth. Earlier this month, Iranian officials strung him up, hanged him for 12 minutes, cut him down, pronounced him dead, and sent the body off to be buried. Except morgue workers the next day noticed steam in the plastic in which he was wrapped ... and the state found itself resuscitating and hospitalizing the guy it had failed to properly kill. 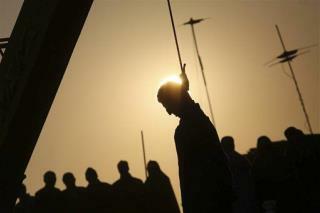 "Iran is thought to have executed (successfully) 508 people so far this year" Texas is soooo jealous. I'll bet they wouldn't have the balls to execute a Phillip Morris representative in their country teaching children how to smoke. Don't be fooled by their gesture of simulated intolerance for drug dealing. For the right price they just love the money tobacco brings. "a 37-year-old drug smuggler sentenced to death for having been found in possession of a kilo of meth." Gotta love that conservative justice.